My interest in Pinkerton started when I got some home grown fruit from a friend in California and to my surprise is was excellent. Also I was surprised at the shelf life, it took about two weeks to get soft to eat, something I had never experience. It is a commercial variety in California and other countries. I know Pinkerton has a history in South Florida, is not rated very well by some local "raters", the same people that give the highest rating 5 to a Russell, flavor wise, and I give it a 2. Is all relative. A lot of the local commercial growers that had Pinkerton have top worked their trees in So. Florida. I asked one how it tasted, "excellent like Hass" I assume it was a production issue. I would like to experience the issues for myself and report to you and let you decide. I have asked other "old timers" and they said it does not ripens evenly in So. Florida. On January 2013, I top worked a tree, it is growing well, 3 grafts took so we are well on our way. Now patience is all it takes. Stay tune. March 30, 2013: The top worked tree is doing great see below. December 2, 2013: This tree has some flowers open, this is very early. July 4, 2014: The tree is doing well it set a few fruit 4-5 some are growing well. See today's picture. October 11, 2014: The tree managed to set 3 fruits. In the local picking schedule they still show Pinkerton in it. Not sure why, I don't think anyone is growing it commercially. Well, the picking date is October 6 with 13 oz. The 3 fruits in the tree are over the 13 oz. They show the last picking dates for the week of November 17. If there is any value to the schedule, they should be ready. I will leave them to the end of October and may be pick one. October 20, 2014: Decided to pick my first Pinkerton home grown. Came in at about 12 oz. Let's see if the ripen properly. I have tasted these grown in California and they are very good. October 30, 2014: Another surprise, big one!. Today we ate the Pinkerton picked on October 30. Contrary to what I had been told by the local avocado commercial gurus its was delicious, more than delicious, the best avocado I have eaten this year. It ripen perfectly and evenly. Firm and creamy, not watery at all. Very small seed and a great taste. Easy to peel very clean no scab or any other disease in spite that the tree is located with the early varieties that get two sprays early in the season. I picked the other one today It came in at 13 oz. I prefer this fruit over store bought Hass from over seas that gets picked too early and stored too cold by the shippers and retails stores. I only have one more this first year I we are going to eat it. Dry weight test will have to wait until next year but suspect in the high teens or even low 20's..
November 8, 2014: I found another fruit in the tree, so there are two left. They seem to be growing. The tree is also getting ready to flower as well. Seems like its going to flower before last year. I will let the fruit grow a bit more and closely watch. The fruit picked in October 30, has not ripen. I expect it could take 10 full days or more. I think these have a different picking dates than the info in the picking schedule. November 14, 2014: Picked a fruit in the 14.8 oz. The fruit picked in October 30 we ate in November 12 continues with excellent quality. I ran into some "old Timers" I asked about this fruit. One guy said something new that the problem packing houses did not like the Pinkerton was because It would not mature in cold storage and that presented a problem for them. I have placed the fruit picked today in 59 degrees will leave it there for 5 days. December 12, 2014: The Pinkerton is almost in full bloom at the moment. January 11,2015: Pinkerton continues in full bloom. Huge flowers. The tree is setting a lot of BB size fruit while still holding fruit on the tree. That is something rare in our area.I don't want to pick the fruit that is left to see how long does it last. This tree is coming into its second post top working flowering season a crucial point to see how the tree does here. February 1, 2015: Pinkerton tree is in its final stages of blooming but has some gas left. Huge flowers, seem like it is going to set a good amount of fruit. The last fruit mentioned above dropped around the 3 week of January. Nice range, October to mid January. February 13, 2015: The Pinkerton keeps on blooming and setting a lot of fruit for its second flowering. This tree has been a real surprise. March 9, 2015: This tree keeps amazing me see today's pictures the amount of fruit set. I hope there is fruit drop soon. The tree is not going to be able to handle it. March 20, 2015: See video bellow.From experience this second year the tree will have bigger fruit I hope they get into the 16 oz range. But on the other hand it has so much fruit that may not size it up. June 13, 2015: Finally the tree is dropping some fruit. The fruit continues to grow but it has slowed down. Still too much fruit for the tree to take to maturity. If it does not shed another 30-50 fruits will have to do manually. This is definitely a tree to follow closely, specially for the homeowner for its production an quality. August 6, 2015: In early July I took off 30 + fruit from the tree. Seem to still be holding a lot of fruit and the tree seems to be struggling with it. Even though the tree looks decent. The fruit does not seem to be growing a lot. compared how they were in June 13. The tree in not flushing new leaves seems to be just handling the fruit. As result if it does that every year will stay small in size. There are three more months to maturity date so it has a chance to grow the frit some more. The positive side is thet the fruit is growing very clean no apparent diseases. September 19, 2015. The Pinkerton tree looks a little better. The fruit is small. I have not giving it extra fertilized no to accelerate fruit drop. I took off some fruit a while back, some have dropped since but still in my opinion, it is holding too much fruit. The fruit that is expose to the sun get burned and eventually falls or gets diseased. As the video to the left shows the sheltered fruit looks very good. If I decide to grow another tree and I probably will, I will strip all fruit for 2 years to give a chance to the tree to get established. October 18, 2015: Last year I started picking fruit so I went by the tree and picked one of the largest I saw. came in at 11 oz. This is 1 oz less than last year but last year there were 3 fruit now the tree is loaded. The tree seems to be struggling with the fruit, foliage is poor and dull. I hope next year the tree will bear less fruit so it can get stabilized. Because of the poor foliage a lot of the fruit is getting sun burned. These take a long time to ripen. I will continue to pick every week. ​November 18, 2015: Not a lot of fruit is dropping from this tree. The sun keeps hitting the fruit due to lack of foliage. The tree looks bad from rearing so much fruit. I did picked a few fruit today and will see how the ripen, some in the 9-10 oz range a few very small 7-8 oz. According to the California Avocado Commission the fruit is from 8-12 oz, last year I picked some in the 11 oz range but only a few. They seem to be running small and the tree looks bad. I'm undecided if to strip the tree clean to let the tree flower again or leave the fruit on and not have the tree flower next year so the tree could recuperate. 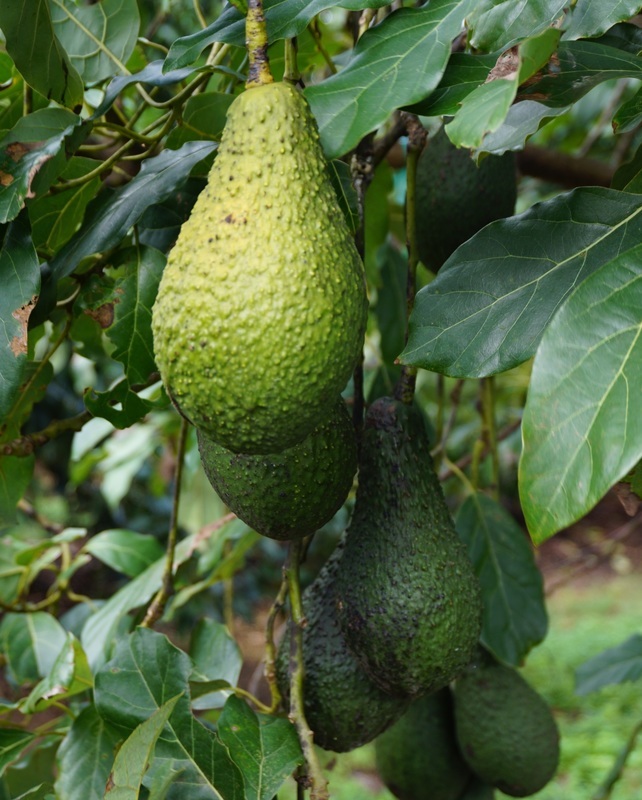 December 5, 2015: The Pinkerton avocados are small 7-8 oz on average but they are ripening well as you can see from today's Picture. Very small seed, a lot smaller than a store bought Hass. December 12, 2015: I have to rethink this variety, last year when it only had 3 fruits they were better, larger. This year the fruit is very small, huge production. By now most of the fruit is dropping quickly. Not happy with it this year. January 16, 2017. This year this tree seems to be doing a but better. I have been picking fruit since November 1. It produced less fruit than last year, for which I'm glad. There it still fruit in the tree and some branches are flowering. The reality is that compared to California the fruit is a lot smaller, The fruit exposed to the sun gets sunburned, but it produces a lot of good quality fruit. It has a lot of the characteristic of Hass, like fruit ripening and holds to be consumed a few days later. Very small seed. One thing I'm observing is that the tree in my grove is staying small. I know that in California grows larger. It could be that since it produces so much, it does not have time to recover. I have seen that in other trees. Also it was top worked on a tree that I know for a fact was root bound. Seem like it is going to hold fruit for another two weeks. July 10, 2017. Today I made a short video of the tree since a lot of you are interested in it. Out of all the California trees growing in my grove this is the only one that has real possibilities and you get a very good quality fruit. Considering that I just paid $2.99 for a 8 oz Hass and it is a gamble because you could open it and can be bad, this is a good choice. Just as good or better than some store Hass. A lot of people write to me asking for similar to Hass that can grow in Florida I think we should give the Pinkerton a try. Very resistant to disease, can handle the humidity and excess rain we get. The shelve live is really good. Small seed, can grow to decent size a range of 9 -14 oz. Fruit from Mid October to the end of December. I also think will do better a little north of here.